Soraya was awarded a BSc Hons in Biochemistry from the University of Surrey. During her degree, she spent a placement year in France working for the CNRS exploring a range of in vivo techniques in a model of narcolepsy. Following this, she was employed as a Molecular Pathologist based at Eli Lilly and Company specialising in neuropathology of neurodegenerative disorders. 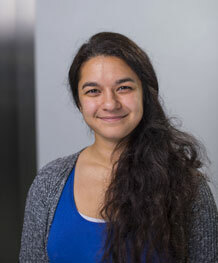 Currently, Soraya is performing PhD research; exploring alterations in neuronal and synaptic microstructure in a mouse model of dementia under the supervision of Dr Jon Brown, Dr Jon Witton and Dr Mike Ashby. Soraya started her PhD in Sept 2016 supervised by Dr Jon Brown (Exeter), Dr Jon Witton (Bristol) and Dr Mike Ashby (Bristol) funded by the MRC GW4 BioMed DT Programme. She is exploring neuronal and synaptic degeneration and dysfunction in the rTg4510 mouse model of neurodegeneration and dementia using a number of techniques, mainly electrophysiology and two-photon microscopy.